The CBR600 FX and FY models were the last of the CBR600 range to use a carburettor for fuelling (the next model, the CBR600 F1 used a fuel injection system). 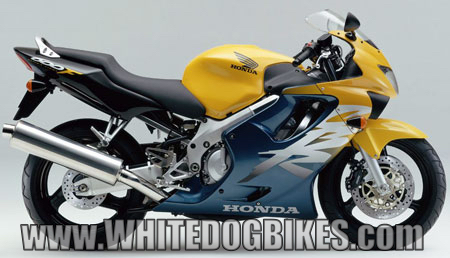 The model was completely redesigned and uprated for it’s November 1998 release including new bodywork which included air intakes on either side of the front fairing (by the headlight) and a higher revving engine which was made possible by using larger valves, shorter stroke and a bigger cylinder bore. The model had numerous other changes and upgrades including a new frame which was a twin spar aluminium frame (called a ‘diamond’ frame by Honda) which helped to make the bike 16kg’s lighter then the previous model and the engine crankcase was part of the swing arm mounting. It also benefitted from uprated rear mono shock, 43mm front forks, calipers, headlight and new spark plug caps with ignition coils built into them. 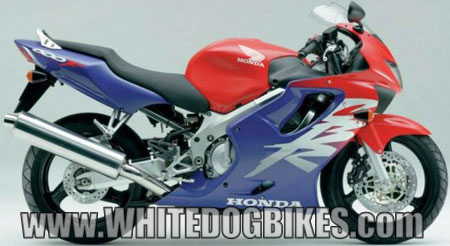 A little bit about the Honda CBR 600 F4…..
CBR600 FX (Nov 1998 to Aug 1999)….. Description: All new, redesigned CBR600 model. Has new twin spar, aluminium alloy ‘diamond’ frame, uprated suspension, all new engine, 4-2-1 exhaust system, ignition key immobiliser system (Honda H.I.S.S system), new fairings with air intake ducts on the sides of the front fairing. 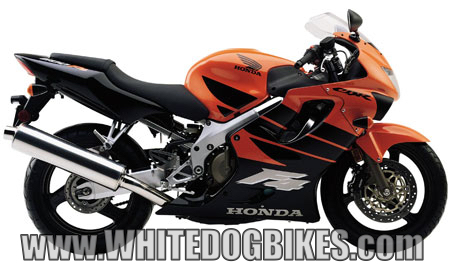 CBR600 FY (Sept 1999 to Nov 2000)….. Description: Same as above model with new colours. 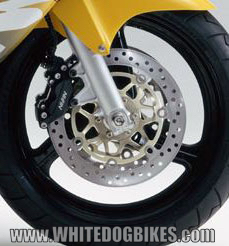 Many owners have increased the bikes acceleration by using different sized sprockets. You can use a 1 tooth smaller sprocket on the front (15 teeth instead of 16), personally, I used a 2 tooth bigger sprocket on the back wheel (46 teeth instead of 44) which I found a better set up (reducing the front sprocket by 1 tooth is approx the same as increasing the rear sprocket by 3.5 teeth). Note: Honda did recommend that owners in colder climates (with average temperatures below 5 degrees C / 41 degrees F) should use a CR8EH-9 spark plug. This model was the 1st CBR600 to use a spark plug cap with a built in ignition coil and did away with the separate coils found on older models. Note: Be very careful if your buying one of these with the key missing or a damaged lock. This model came with 2 keys and Honda would allow the owner to buy 3 more using a code, after which the whole ignition system had to be replaced (to the tune of around £1500 in the late 1990’s!). The HISS system comprised of the key with a transponder in it, immobiliser receiver (in the ignition switch), immobiliser light (in the clocks – not 100% sure if you’d have to replace these) and was connected to the bikes ECU, all these parts would have to be replaced if the key was lost and a new one couldn’t be obtained. 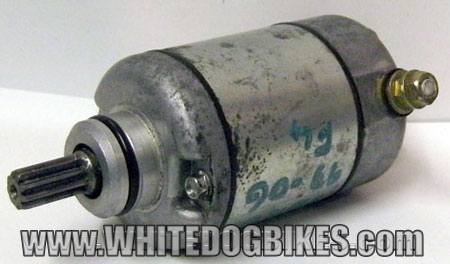 Although, I have heard the US CBR600 F4 models didn’t have the HISS system so it was cheaper to buy the uncoded replacement parts from the USA? Middleweight sports bike from Honda that was heavily redesigned for the November 1998 release to compete with Kawasaki’s ZX6R Ninja and the much newer and radical Yamaha YZF-R6. Although it was no real competition to the Yam R6, the CBR600 was a good, solid all round sports bike that was both good for a quick weekend blast or a long few weeks touring round Europe. The new CBR600 was 16kg lighter then the previous model which was achieved, among other things, by a new designed frame. European models were also fitted with the Honda H.I.S.S system (Honda Ignition Security System) which was an factory fitted immobiliser system. The model was dedicated by Honda to Dirk Vandenberg and Josef Boyd who were Honda R and D senior product developers for this model and were killed during the final testing. Performance wise, even by modern standards it’s a quick bike. Although it didn’t quite have the racing image of the Yamaha R6 or the ‘bad boy’ image of the ZX6R Ninja or the GSXR600 it still easily kept up and beat most of the competition (I had one in the late 1990’s the dated ZX6R’s and Gixxer 600’s couldn’t keep up with it!). 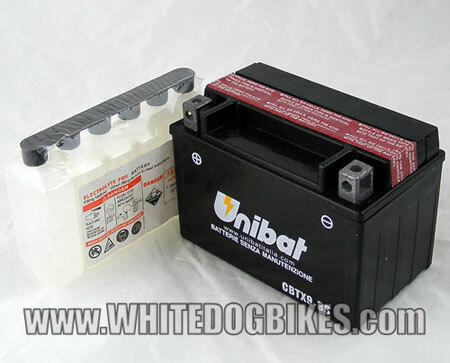 They were also used in stock 600cc racing series. The main things that set the CBR600 apart were Honda reliability (I covered 55,000 miles in one in 2 years, missed most of the services and it only broke down once, which was totally my fault as I went through a deep puddle and got water in the airbox!! 🙁 ), and, unlike other bikes that had you clutching your backside after 25 miles it was comfortable, you could ride 300 miles and/or ride all day on one. The only thing that really let it down was the stupidly small tank range (around 120 miles…. 110 if ridden hard!) which meant if you were doing alot of miles you couldn’t stray too far from a petrol station! The bike had a claimed 110bhp, which worked out to about 94hp at the rear wheel, 0 to 62 time of 3.2 seconds and a top speed of around 158mph (it will actually do this….. so I’ve heard!). Performance parts were readily available as there were loads of these models sold and, you could get more specialist parts (rear sets, racing cam’s etc) due to the bike being used for racing. Braking wise the bike was a fairly good stopper as standard, the 4 piston front calipers had the stopping power to keet you out of trouble. Improvements could be made by fitting braided hoses and HH pads to the front. Good, solid bike from Honda. There were 1000’s sold so there are still plenty about. Mileage isn’t really anything to worry about as long as it’s had oil and filter changes and the cam chain has been changed at the service intervals (if the cam chain snaps it’ll destroy the engine!). There are quite a few ex racers around. 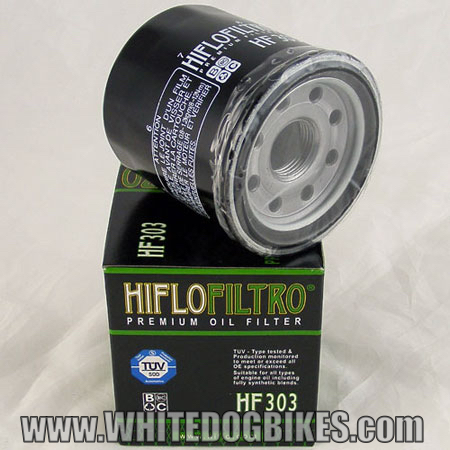 Due to a harder lifestyle on the track they can have lots of niggling little faults and because there are alot of these bikes about, it might be better getting a non raced example if you have the money (racing bikes can often be spotted by drilled sump plugs and other bits). Also, people have reported the Honda HISS immobiliser systems failing. This could prove expensive as the system is connected to the ignition and ECU. Apparently, US models didn’t have this system so people did buy key, ignition switch and ECU sets used from the USA (but I don’t know if this is true or not?). They were built to take a reasonable knock as well, so lightly damaged bikes aren’t a problem (although fairings will be difficult to source now as the bike is 17 odd years old). Also, if you buy one with the original rear shock and brake hoses, these will probably be due for replacement. The standard exhaust systems were mild steel and did rot (nothing unusual, just the effects of time and weather!). 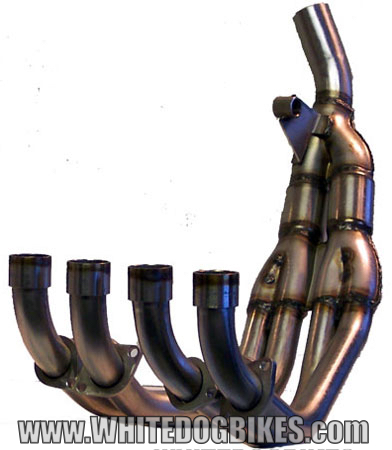 But, replacement exhaust headers, link pipes and cans of dubious stainless steel quality are readily available for not much ££’s (exhaust downpipes can be bought for under £200).